Functional and aesthetically pleasing, block retaining walls may be the ultimate solution for the corner of your yard that seems to just need something more. There are many benefits to installing block retaining walls, such as adding a raised planting bed to add depth and privacy to a flat yard. 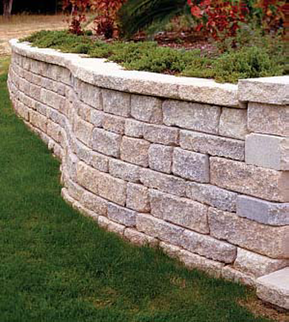 Or a block retaining wall will add formality to a design, retain soil, and even correct grade or drainage issues. Our beautifully designed and installed retaining walls can add more functionality and useable space to sloped yards as well. These manufactured blocks can even be used as sitting walls for extra space while entertaining or used to create an elevated/raised garden. My Handyman OnDemand will provide you with many choices of blocks with a variety of styles, sizes and colors. Call us today to start transforming your outdoor space.